Since 1992, MWRA has monitored winter flounder, lobster, and blue mussel. 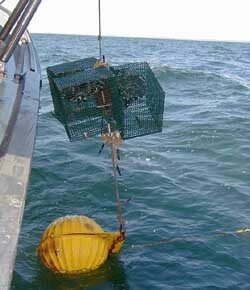 Flounder and lobster for testing are collected near Deer Island. Mussels are collected from relatively pristine sites and then transferred to cages which are placed near Deer Island and in the Inner Harbor for up to 60 days, to permit bioaccumulation of contaminants. Flounder caught near Deer Island have a much lower prevalence of liver disease than those caught in the 1980s. Liver tumors are now rare. Levels of contaminants in flounder fillet are well within U.S. Food and Drug Administration (FDA) guidelines. To make sure the flounder are safe to eat, MWRA measures mercury, PCBs, DDT, and other pesticides in the edible flounder fillets. Mercury levels in winter flounder have been stable at about 50-100 parts per billion, well below the U. S. Food and Drug Administration (FDA) limit of 1,000 parts per billion. Levels of PCBs and DDT are also well below FDA limits. For definitions of these contaminants go to the Glossary page. In 1988, over 75% of flounder collected in Boston Harbor showed evidence of liver disease associated with contaminant exposure. Liver disease has been decreasing since the 1990s and levels are now at less than half of what they were before the Boston Harbor Project. Liver disease in winter flounder is an indicator of pollution effects because the liver can be damaged as contaminants are metabolized. The high prevalence of flounder liver tumors characteristic of fish from Deer Island Flats in the 1980s are a thing of the past, and has never been observed in flounder collected at the site of the MWRA outfall that discharges in Massachusetts Bay. PAH levels in mussels have decreased and PCBs, pesticides are well within guidelines. For this study, mussels from relatively clean areas in Gloucester and Sandwich were put in cages and placed on moorings for one to two months at the Inner Harbor near the New England Aquarium, and Deer Island Flats. Upon retrieval, the mussels were analyzed for lead, mercury, PCBs, PAHs, DDT, and ten other pesticides. PAHs in mussels have decreased since the early 1990s. MWRA checks lobsters caught near Deer Island for external signs of disease, and tests the tail and claw meat for mercury, PCBs, DDT, and other pesticides. The hepatopancreas is tested for the same contaminants plus lead, cadmium, copper, nickel, silver, zinc, chromium, and PAHs. The levels of contaminants in lobster meat are well below the FDA limit for human consumption.